Our Community - Dawn and Mike O'Connor - "Going 'Barefoot' in San Pedro"
More and more businesses continue to sprout up around San Pedro providing visitors with the needed requirements for a perfect vacation. Gift shops, restaurants, travel agencies and any other business that is directly involved with tourism play a big role in maintaining this industry. This is the case of this week's couple, who together with their experienced staff add to the great fun that can be found in San Pedro-Dawn and Mike O'Connor. Dawn Marie Kopp was born and raised in Washington State where she attended Prairie High School graduating in 1981. Starting in her sophomore year of high school, she went to work with W.W. Grainger Industrial Wholesale Supply Company. A determined young woman, Dawn held various positions in the company from unloading trucks to being the youngest female manager of the firm, to establishing herself as the top producing sales representative in the northwest. Dawn worked for twenty long years in this field retiring from W.W. Grainger in 1999. In her personal life, Dawn was happily married for six years until her husband succumbed to leukemia, leaving her a widow at a very young age. Michael O'Connor was born and raised in Detroit, Michigan and holds a Bachelor of Arts Degree in Education and a Bachelor of Science Degree in Management from Central Michigan University. Mike worked with General Motors for ten years where he assumed different posts, including quality assurance and management. He then moved on to managing industrial plants including Conmet in Oregon in 1996. Like Dawn, Mike was married but lost his wife during the birth of their third child. Destiny would later unite these two broken hearts in Oregon, where they consoled each other. As a result, a beautiful friendship was born which led to dating and eventually marriage in April of 1998. Together, Dawn and Mike have six children: Lesley, Chris, Branden, Meaghan, Matthew and Sean; and one grandson Logan. Having a good eye for business and investing heavily in a "start-up" company, Mike was able to reap the fruits of his investments. Dawn and Mike decided to take a vacation and opted for Belize after hearing about the spectacular diving. Mike had already traveled to the Yucatan Peninsula in Mexico during the 70s and 80s but had never made it to Belize and this sparked his interest. Prior to their vacation, the O'Connors looked at various destinations to begin a potential business, including Florida and the Bahamas, but saw a lot of potential downfalls in these places. 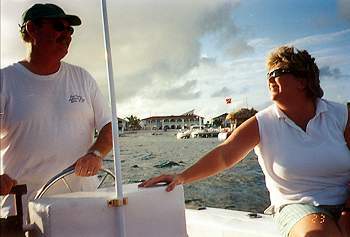 In October 1999, Dawn and Mike arrived in Belize and after their third day in Ambergris Caye, Dawn realized that this was the perfect place, just what they had been looking for. Having that thought imprinted in their minds, the O'Connors took some time from their vacation to look at real estate before returning to the US. Two months later they returned to San Pedro with their children for five weeks to give them a chance to experience life on the island. Of course, the children were delighted with the sandy beaches and crystal water immediately in front of the island. Having received the final stamp of approval from their children, Dawn and Mike eventually purchased the real estate where their home and business are now located. They set their minds on opening a water sports activity business that would include parasailing, jet skis and water mice. Back in the US, they made the final arrangements to relocate to Belize and on June 28th, 2000, the O'Connors returned to San Pedro to stay. They immediately went to work on their business which they named Barefoot Diving and Watersports. After only three months on the island, the O'Connors withstood Hurricane Keith with only minimal damage to their business and home. This natural disaster also brought out the humanitarian side of this couple as they housed 38 people. When things returned to normal, Dawn and Mike went back to the drawing board and expanded their business which now includes two new boats, the Barefoot Express (former Blue Hole Express) and a54-footBlue Water Coastal Cruiser. These two particular vessels will be used for day and overnight trips to the outer atolls and for Whale Shark watching. 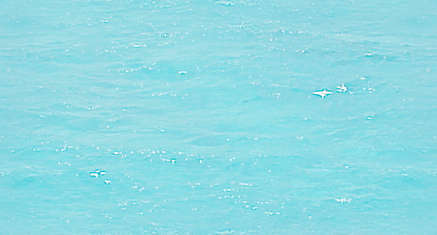 Today, Barefoot Diving and Watersports employs ten full-time workers and expects to increase to sixteen by high season. Dawn and Mike still make time to enjoy what they originally came to San Pedro for - diving. "We sometimes get frustrated with the system in Belize but manage to get through it and remember why we moved here in the first place. These have been lessons well-learned," stated Mr. and Mrs. O'Connor. Both Dawn and Mike work hand-in-hand with their employees and say they work hard when the time calls for it, but also make time to relax. Dawn and Mike explained since both come from a corporate business environment, they want their business to be fun. "When we are not busy we spontaneously take out the whole group for a day of fun, whether it is snorkeling, diving, a trip to Caye Caulker or attending town functions," stated the O'Connors. Although Dawn and Mike have encountered a few obstacles settling down in San Pedro, the rewards of living on this island seem to make up for it. They have worked very hard to adjust to their new lifestyle and have also been very generous with donations to the town. As investors, they have gone by the book and as business owners they have led by example. Because of this and much more, Dawn and Mike O'Connor are recognized and applauded for providing many with unforgettable "barefoot experiences" that can only be found in "Our Community."